Man has always, I suppose, been a hero worshiper. Doubtless he always will be. We Americans do not seem to take to religious prophets. We have no Queen Marie, nor even a Mussolini, to raise upon a pedestal. Consequently we turn hopefully to the world of sports. There we will find the material to satisfy our lust for hero worship; there we discover the true gods of the nation. Messrs. Hagen, Tunney, Tilden, Jones, Ruth, Cohen, Dempsey – these become the idols of America’s masculine population, young and old. And why not? After all we ask ourselves, are they not athletes? Have they not been cleansed (and so sanctified) in the great white heat of competition, upon the links or the gridiron, the court or the diamond. That competitive sport – any kind of competitive sport from squash tennis to prize fighting makes for nobility of character, such is the first commandment of the American sporting public. This, in fact, is the foundation of the Great Sports Myth. Yet, in plain truth, highly organized competitive sports are not character-building; on the contrary, after a good deal of assistance at and some competition in them, I am convinced that the reverse is true. So far are they from building character that, in my opinion, continuous and excessive participation in competitive sports tends to destroy it. Under the terrific stress of striving for victory, victory, victory, all sorts of unpleasant traits are brought out and strengthened. Too frequently the player’s worst side is magnified; his self-control is broken down much more than it is built up. I know this is heresy. I realize that the contrary is preached from every side. (Most fervently, however, the preachers are sports writers, football coaches, or others who have some other direct and personal interest in the furtherance of the Great Sports Myth.) I am aware that the participants in American sports are all supposed to be little short of demi-gods. Yet if football, for instance, is the noble, elevating and character-building sport it is supposed to be why, I wonder, is it necessary to station an umpire, a field judge, a head linesman, and half a dozen assistants to follow the play at a distance of a few yards and to watch zealously every one of the twenty-two contestants in order that no heads and no rules may be simultaneously broken? Business “as usual” in the NFL. 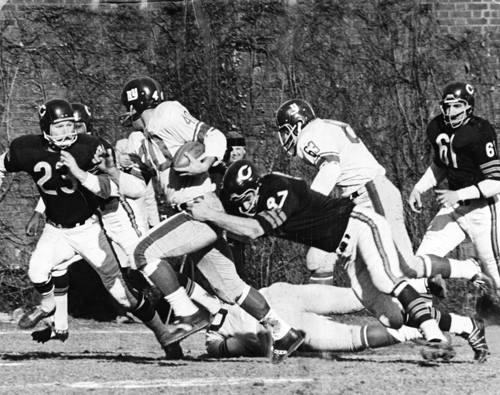 Bears and Giants at Wrigley Field, Dec. 29, 1963. He said there has been indeed a precedent for that, but mostly it has been in cases of grieving individuals, not as a league practice. Harvard and Yale, with a tradition that makes a mockery of the ender roots of Rozelle’s league, refute him bluntly, if not by design. For the first time 88 years they suspended Harvard vs. Yale, unaffected by any feeling that the show must go on. That Harvard was the alma mater of President Kennedy may not have been a deciding factor in this tribute to him. Almost all of the other major games of the Nation were also canceled or postponed. True, there were no telecasts of the NFL games on Sunday, no raucous invasion of a Nation’s sadness at home. But this was the decision of the networks, not of the league. Theirs was the taste to proclaim that this was no day for football carnival. Even in Las Vegas, the new bastion of show business, there was no official sentiment that the show must go on. On Monday’s day of national mourning, all productions and gambling casinos, were ordered closed. Unlike business as usual in the NFL. Former Denver Bronco tight end, Nate Jackson’s memoir of NFL life, Slow Getting Up got a nice write-up in The New York Times. I hadn’t heard of him either. There is, as you’d expect, much dish on injuries, their prospect, recurrence, treatment and inevitability. With two teams, Jackson spent six years playing pro ball, which, we learn, is twice as long as the average length of an NFL career. The NFL should remove marijuana from their banned substances list. Don’t tell anyone about it, just stop testing for it. Pain is a big problem in the NFL.